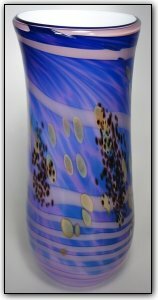 This beautifully colored vase features violet purple hues with mocha spotted accents and a coral pink spiraling wrap. It has a pearl white interior giving it the appearance of a shell like ocean form. It can hold a large bouquet of flowers or stand alone as a beautiful work of art.